The Kony video famously generated 70 million views last week. It left many marketers thinking of the “viral video” as a silver bullet. If a viral video could raise so much awareness of an Ugandan warlord, then maybe a viral video could raise awareness of a brand’s single minded proposition. Marketers often add viral videos to marketing plans as if “viral” is as predictable as the circulation in a coupon drop or the number of samples in a sampling event. 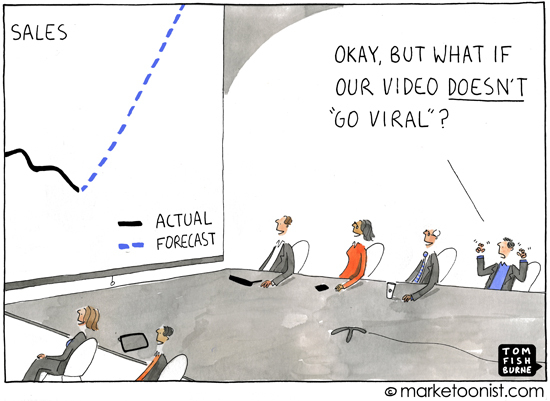 What marketers forget is that no one can create a viral video. We can only create quality content that may or may not go viral. Kevin Allocca from YouTube recently shared that every minute, 48 hours of video are uploaded to YouTube. An infinitesimally small number of those videos “go viral”. While he notes some of the tactics that can lead to viral videos (such as the role of “tastemakers”, which was a big factor in the Kony video), we never know in advance what video will catch on. For every “double rainbow” or “ultimate dog tease” that spread like wildfire, there are countless videos that don’t. 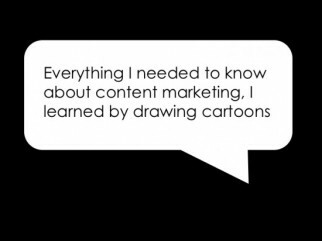 On Friday, I gave a talk on the topic of “Content Worth Sharing: What Marketers Can Learn From Cartoons” at an online conference put on by MarketingProfs (for those of you who didn’t make it, I posted my talk and notes). My main message was that continuity trumps virality. Rather than chase the elusive viral video, commit to ongoing content to grow your audience over time. One of the greatest viral marketing success stories is Orabrush. They make a tongue scraper to fight bad breadth. It’s not the most exciting product category, but their YouTube channel has been viewed 46 million times. They credit their success, not to a single viral video, but to an ongoing commitment to quality content, such as the weekly webisode series, “Diary of a Dirty Tongue”. Their main advice: “everyone is on a rampage to figure out how to make their viral video. To gain a loyal following, create a steady stream of content; it’s not enough to be a one-hit wonder”. As always Tom, you’ve nailed it! My least favourite expression found in marketing plans is ‘a viral facebook app/ video/ email/ mobile app.. substitute what ever the latest fad is’ – surely ‘viral’ is an effect of a great piece, not an upfront determined characteristic. If we instead focus on creating engaging, compelling content that is interesting enough to share, there’s a good chance that not only will the content be shared and ‘go viral’ but more importantly the brand we represent will be loved and shared and gain longevity. From my soon-to-be marketing graduate perspective, I am overwhelmed by the recent developments. I have never been a big fan of social media – I was more of a healthy cynic in a way that I – literally – just don’t buy what I am told online. The continuing communication, the “steady stream” as you call it, might not seem a viable tool for some companies, since it doesn’t create immediate ROI and therefore doesn’t justify either a higher marketing budget nor head count. If, however, a company succeeds in creating a viral video, it enables the business to create ROI that for the respective executive will be a valuable aid to fulfill their sales quota (short-term ofc). Short-term sales volume – not so bad! Because maybe yesterday’s short-term is today’s long-term? Here we could ask ourselves – why do we automatically assume that views on e.g. YouTube equal sales? Maybe the target group doesn’t even know what YouTube is? But let’s not open a can of Marketing ROI. There is a vast array of FMCG products that substitute each other in terms of quality, price et al. 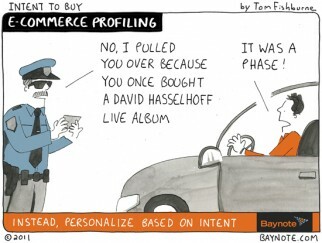 and therefore companies are desperate to create a tempting USP that somehow evokes purchase/awareness and the like. However, taking into account the tough market environment, price cannot be that screw that they can turn in order to adapt to their customers. Hence, businesses thrive to create content that puts their brand into the spotlight, even if only for a minute or two and hope for biblical reactions. This leads me to my last point; traditional IMC was based mostly on media which was not cost-free for the publisher. Nowadays, due to technological advancement, people can publish whatever, whenever and for whatever reason for literally no cost at all. I think creating videos, publishing them and sitting at home with fingers crossed has become so easy, that every aone can do it. If, however, the brainchild does not evolve and develop as intended, companies can hope, depending on the severity of failure, that it will drown for good in the clutter of inefficacy. Customers are nice – they tend to forget – isn’t that right Nestlé? Well said and right on. The pursuit of the viral video reminds me of David Ogilvy’s observations about putting a gorilla in a G-string. It will get you noticed, but what will it sell and what will it say about your brand? A few months ago our agency had a video attract almost two million views over a few heady days. It was fun for us and the client, but the inevitable question came right after–what was the return on that? We had an answer, and the client is committed to an ongoing program of likely-non-viral engagement with customers through video and social media. Our goal is to attract and serve customers through a growing online video resource. If something goes viral, that’s gravy. Dead right. I lecture on word-of mouth & viral marketing at a local college and frequently I get the question “How do I make something go viral?” as if there’s a simple formula. Each time I explain patiently that effective word-of-mouth marketing is about hard work and persistence. Actually, I find that the people who focus on making something go wildly viral tend to be ones who are interested in the challenge for its own sake, rather than the marketing objectives that should be driving their actions. It seems the concept of runaway virality’s a virus in itself! Many thanks for sharing these insights. I love Ogilvy’s image of a gorilla in a G-string. Hysterical. This week’s print goes to Bill. I like the specific client example and also the idea of this communication as a “resource”. That shifts the focus from the company to the audience. What we create should be of value to our audiences, not merely an attempt to get as many impressions as possible. The main message I took away from it is that social media is a means to an end, not an end in itself. It’s important to make sure the virus has a good message to inject into the public bloodstream! How about this for an insightful comment – you’re brilliant! Delighted to read the post and always enjoy your cartoons – still treasure your book from the SkyDeck! But in a larger sense, I do think that the way to think about the Kony video is this: It was a great story, with human elements that connected on an emotional level far better than facts, stats, figures can. In other words… it’s all about the story and (as you say) the quality of how you tell it. You can control for quality. Viral is nothing more than a happy accident. Thanks for doing such a great job at the MarketingProfs event. I look forward to doing more great stuff together! While I can’t declare love like the previous poster, I did just quote your cartoon on a post on our company site – http://www.idiro.com/blog/viral-marketing-no-magic-bullets. Thanks again!